Since we started operating mini coaches in the 1980s, we have grown to become Cumbrias largest independent bus and coach operator. Our expertise, experience and quality of coaches is unrivalled throughout the country. Reays are an award-winning family business that combines 21st century technology with a good old-fashioned personal touch. Renowned for providing the very best in luxury coach travel, while offering the latest in safety and comfort, we have a reputation for quality and reliability - always at competitive prices and thats how it has always been. 1985 - The business was set up in 1985 by the late Walter Reay, father of current Managing Director Chris Reay. Walter initially ran a single eight-seater mini-bus on Cumbria County Council school contracts. 1990 - Chris joined the business on a full time business, leaving the family building business, establishing an operating centre in Fletchertown. Under Chris leadership, the company has expanded into a hugely successful business, while still maintaining its family roots and ethos. 1990 - The business moved from Fletchertown to larger premises at Miller Park in Wigton. 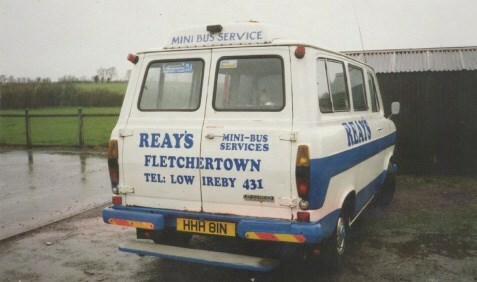 2001 - Reays were awarded their first public service bus contract from Cumbria County Council. 2003 - Nicola Reay joined the business on a full time basis, bringing her experience and accountancy qualifications with her. In the same year Reays purchased its first VIP coach to service Carlisle United Football Clubs team travel arrangements. 2004 - Having outgrown the Miller Park premises, land on the outskirts of Wigton was purchased to build a purpose-built headquarters. Purchased an operating centre in Egremont. Cumbria County Council awarded Reays the '75 Bus Service' after a competitor reneged on the contract claiming it was not viable  this was the launch of the first 'City Hopper' service for Reays. Finalist at the CN Business Awards for 'Business of the Year'. In October the 'City Hopper' services were expanded upon and a further bus depot and Travel Centre in Carlisle were opened. Awarded official transport partner for 'BBC Radio 1s Big Weekend' at Carlisle, transporting over 40,000 people across the weekend. Winner of 'Medium Business of the Year' at the CN Business Awards. Gained VIP travel contracts for Blackpool, Bradford, Accrington Stanley and Burnley football clubs. Awarded 'Top Independent Operator' at the UK Bus Awards. Awarded school contracts in Penrith area where a new depot was then established. Awarded contract for Risley to Sellafield VIP shuttle service. Finalist at the UK bus awards  'Highly Commended for Marketing Excellence'. Finalist 'Business of the Year' category at the CN Business Awards. Finalist 'Medium Bus Operator' of the Year at the Route One Operator Excellence Awards. Expansion of Wigton headquarters, transferring Carlisle operations into Wigton. Relocation of Preston depot to Ashton in Makerfield. Relocation to alternative property providing better access for coaches on Gilwilly Industrial Estate, Penrith. The successful award of the Sellafield contract to Reays secured the future of our Egremont depot and staff. Workforce has now increased to 130 staff. Finalist 'National Coach Tourism Awards. Finalist Driver of the year - Shaun Murphy. Finalist Brochure of the year reaching the final 8. Finalist Route One 'Operations Manager of the year  Chris Bowness. Finalist Route One 'Large Coach Operator. Became a member of Carlisle Ambassadors. Reinvented our branding and logo. Additional premises purchased in Egremont for a new depot. Opening of new Workington depot after relocation of a Ccumbrian coach firm. Re-awarded Risley to Sellafield VIP shuttle service. Charity walk to Machu Picchu raised £4639.56 for Eden Valley Hospice. Red Ribbon Awards 2017 - Reays awarded regional North West winner for the 'Best Family Business'. Finalist 'Cumbria Family Business Awards'. WINNER of the 'Best Cumbrian Family Business' at the Cumbria Family Business Awards in the 'Transport, Haulage and Logisitics' category. WINNER of the 'Holiday Programme of the Year' award at the British Coach Tourism Awards. Now in 2019 Chris continues to lead the way as Managing Director and its his drive and energy what continues to push the business forward. He is no stranger to the front line as he insists on finding time to stay in touch with staff and customers and he can regularly be found behind the wheel of one of the companys coaches as a driver, often to the surprise of passengers! When asked what keeps him motivated, he simply replies I love the industry, Im a complete bus nerd and its a delight to continue my fathers legacy. When I look around and see customers laughing and enjoying their time with us be it on a holiday or a school run, I cant believe how far weve come. Chris wife Nicola is the companys Finance Director and sits opposite him in the headquarters at Wigton every day of the week. Despite all the success and expansion of the business over the last two decades, Chris and Nicola continue to work brilliantly together to drive the company forward in new and innovative ways. As well as being husband and wife, they are also a great partnership in business, with Chris ideas and vision complementing Nicolas financial realism. Now with a fleet of more than 100 vehicles and a workforce of 150 employees, the business continues to grow from strength to strength. But dont take our word for it... Major international tour operators like Kuoni and Interski choose Reays to take their international tourists all over the UK. Plus, Premier League outfit Burnley Football Club are among the many professional and amateur sports clubs whose players travel with Reays because they know theyre on to a winner with us.